I for one am not excited about 12z runs. Slight north trend but northern extent of precip shield barely extends to NYC metro on all models. Cautious optimism at best. Euro showed some improvements at 12z. Better heights and less confluence this run. 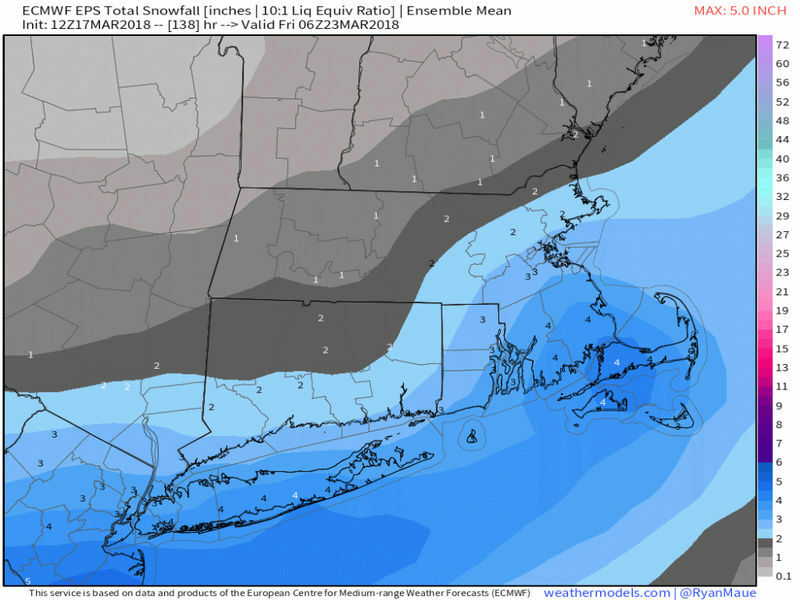 Accumulating snows come north to reach southern half of Jersey. I'm still skeptical of a heavy accumulation around here this late in the game. I do remember a 5-6" slushy snow on the first day of spring 3-4 years back. I'm rather sure that storm was not a coastal storm like this one would be. And I don't remember what the temps were in the few days leading up to that one. So, I suppose if this storm were to be stronger and/or colder than the Spring Day storm, then more than 6" is certainly plausible. Ok come on all let's reel this puppy in and get us a big Godzilla who's with me? jmanley32 wrote: Ok come on all let's reel this puppy in and get us a big Godzilla who's with me? Oh what the heck. You can count me in! EPS look great. A lot of left leaners. I'll take care of the beer. Who's bringing the burgers? Can I have mine cooked in a frying pan on the stove? lets move this to banter! Bro - its a smashburger!!!! Hot cast iron pan = great crust! So many ways to make a burger!!! Looks like Philly is in the lead for the win on the NAM. Come on, lets catch up!!!!!! Can't let them win the Super Bowl and this storm!!!!! 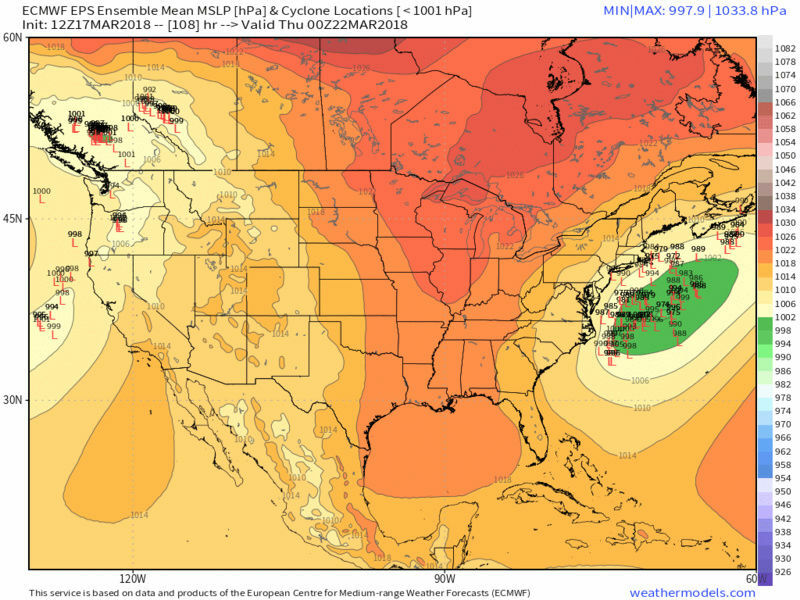 18z runs were disheartening, EPS came north looks like havent looked myself at each member. I am honestly not very optimistic about this threat. The NAM and GFS are wayyy south, yes I know do not live and die by each run and I am not but its been many runs that have shown a far south system or a scraping system at best. So theres going to have to be big changes IMO. Oh wow I never knew there was a reason for the name of the "smash burger chain"
We have seen threats disappear and then come back once sampling is better. Hopefully trend reverses and we get a more northern push! Any possiblity of that happening in this scenario? Gres, you are asking a question for God. Is anyone on this site God. Maybe Frank is , chill out and let the models models play out. That’s all you can do at the present time. "Agreed Frank is probably on the level of Thor"
"Is anyone on this site God. Maybe Frank is"
Spring will arrive Wed with no snow whatsoever. Trees will start to bloom in a few weeks. What was a below snow season here in Central NJ now let's open the windows and breath the fresh air. Again :NO MORE SNOW THIS WINTER SEASON"
I did not need a type of models to tell me this!